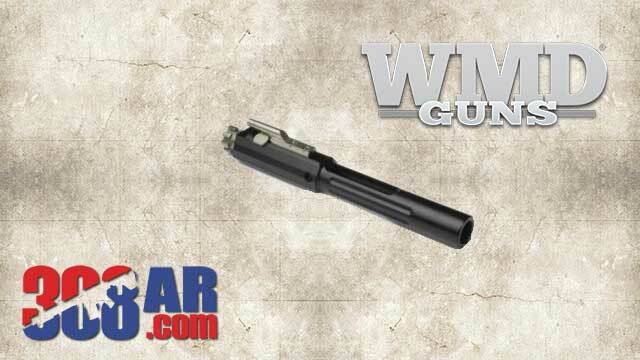 WMD Guns NiBXBCG308-N 308 AR Bolt Carrier Group with Nitromet Carrier is a welcome addition to the ever growing field of 308 AR bolt carrier groups available to shooters today. For the price of a common phosphate 308 bolt carrier group WMD Guns offers a high performance alternative that features the slippery, corrosion and wear resistant Nitromet QPQ coating as well as a heavy duty buffered extractor. The NiBXBCG308-N offers a good option for suppressor equipped 308 rifles. Bolt – 9310 heat-treated. Milspec gas rings. NiB-X coated (Rc70, 40% more wear-resistant than chrome). Extractor – Manufactured, heat treated, and hardened per government drawings. Black extractor, buffer and heavy-duty spring. NiB-X coated. Firing Pin – Manufactured, heat-treated, hardened, chromed and certified per government drawings. Carrier – 8620 material, heat-treated and case hardened. Manufacturing tolerances on inside diameters tightly controlled. Nitromet QPQ processed for Rc55 surface hardness, durability and corrosion protection. Gas Key – Hardened to USGI Specifications and attached using grade 8 hardened fasteners. NiB-X coated. Staked per military specifications. Cam Pin – Manufactured, heat treated, hardened and certified per Government drawings. NiB-X coated. than hard chromium, SBN is extremely economical, with an array of well-documented benefits. Nitromet is a proprietary KC Jones trademark, originally developed by Kolene Corporation. Nitromet enhances the properties of SBN to provide optimal protection against corrosion and wear. Salt bath nitriding is sometimes referred to as ferritic nitrocarburizing, as well as salt bath nitrocarburizing. It is a process that involves thermo chemical diffusion, where a compound layer of carbon and nitrogen is simultaneously introduced to the surface of ferrous metal parts. A variety of metals can be treated with salt bath nitriding, including carbon steel, stainless steel, and sintered and cast iron parts. Nitromet salt bath nitriding is an economic way to increase resistance against corrosion and wear. This is true whether you seek a hard chrome replacement or a more economical solution.